Devin Nunes has a new target: Jonathan Winer, the Obama State Department’s special envoy to Libya, and longtime Senate aide to John Kerry. Winer received a memorandum from political activist Cody Shearer and passed it along to Christopher Steele, the former British intelligence official who had compiled his own dossier on Donald Trump. 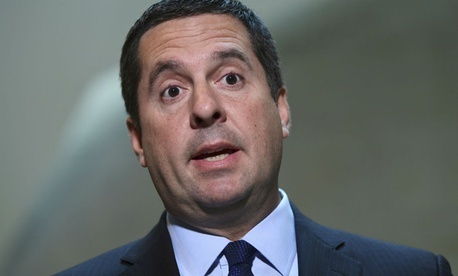 The release of last week’s House Intelligence Committee memo accusing the FBI of surveillance abuses marked the end of the first phase of Nunes’s investigation into the probe of alleged Russian interference in the 2016 election. Now, the committee chair told Fox News on Friday, the probe is moving into “phase two,” which involves the State Department. His focus is on the dossier compiled by Shearer, and passed along by Winer, according to two sources familiar with the matter. The existence of the Shearer memo was first reported by The Guardian. A copy of the document, which I reviewed, contained a range of allegations concerning the president’s personal behavior and financial transactions. The State Department is the second major government institution to enter Nunes’s crosshairs since last year, when he first began examining Steele’s interactions with the Justice Department. Nunes’s defenders say he is conducting necessary government oversight; his critics say he is purposefully trying to undermine the federal investigation into Russian interference in order to protect the president. The Washington Examiner's Byron York reported last month that congressional investigators were “looking into a possible Obama State Department role in the collection and dissemination” of the dossier compiled by Steele, who gave his preliminary findings to the FBI in the summer of 2016. But in television interviews over the weekend, Nunes would not elaborate on how his nearly year-long investigation into Steele and the dossier came to implicate the State Department. A letter released Monday by Republican Senators Chuck Grassley and Lindsey Graham offers an important clue. In the heavily redacted, declassified version of the letter, which outlined why Graham and Grassley asked the Justice Department to consider opening a criminal investigation into Steele’s communications with the FBI, the senators allege that “Clinton associates” were “feeding Mr. Steele accusations” against the Trump campaign, thereby calling into question Steele’s credibility as a neutral source. Two sources familiar with the matter, who requested anonymity because they were not authorized to speak to the press, told me the redacted portions of the letter refer to the information compiled by Shearer—for the first time revealing some of the key details that were redacted in the original letter. Shearer’s information was passed to Steele by Winer. Winer, a friend of Steele’s, was then serving as the special envoy for Libya, and had previously passed Steele’s Russia and Ukraine reports along to the State Department’s Europe bureau between 2014 and 2016. Shearer, Blumenthal, and Winer did not immediately respond to requests for comment. The report alleges [redacted] as well as [redacted]. Mr. Steele’s memorandum states that his company ‘received this report from [redacted] U.S. State Department,’ that the report was the second in a series, and that the report was information that came from a foreign sub-source who ‘is in touch with [redacted], a contact of [redacted], a friend of the Clintons, who passed it to [redacted].’ It is troubling enough that the Clinton Campaign funded Mr. Steele’s work, but that these Clinton associates were contemporaneously feeding Mr. Steele allegations raises additional concerns about his credibility. According to a source familiar with the matter, however, Steele’s “memorandum” was actually a handwritten note on a copy of Shearer’s report that outlined its origin—the “foreign sub-source” who had been in touch with Shearer. The note identified Shearer as a contact of Sidney Blumenthal’s, a longtime associate of the Clintons. It also explained that Steele had obtained the document via Winer, who had gotten it from Shearer. Steele had written the note on the Shearer report while in Rome in October of 2016, while en route to meet an FBI contact there. It is not clear how or why Winer obtained the report from Shearer. A separate congressional source confirmed to me that Winer and Shearer “will both be a part” of Nunes’s impending tussle with the State Department. The Shearer memo with Steele’s handwriting on it was included in the FBI’s file memorializing the bureau’s conversations and relationship with Steele—a relationship that dates back years, as Steele’s firm Orbis had been hired by the bureau for separate projects long antedating the Trump-Russia dossier. Steele and the FBI never had a formalized relationship regarding his research into Trump’s Russia ties in the latter half of 2016, however, according to a source with direct knowledge of the matter, speaking on condition of anonymity due to the ongoing investigation. No contract was signed and no money was ever exchanged, that person said. Steele’s FBI file, with the marked-up Shearer memo inside, was given to the Senate Judiciary and House Intelligence committees in response to document requests.